What do you think will happen if you put soap on a cotton swab, and dip it into three different plates of liquid? The first containing 2% milk and food coloring; the second heavy cream and food coloring; the third, water and food coloring. We think the 2% milk and heavy cream will spread the food colors into a big color explosion because they both contain fat, but not the water because it does not contain fat. 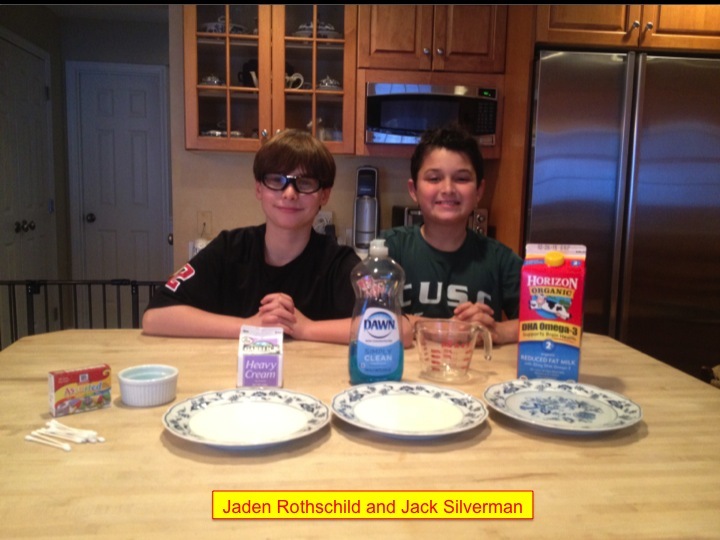 The color explosion milk experiment is a child safe experiment and does not need any safety procedures. Place 3 dinner plates out on a table. One with 125ml of water, one with 125ml of 2% milk and one with 125ml heavy cream. Put 1 drop of yellow,blue,red and green coloring in the center of each plate of liquid. Keep the drops close together. Put the tip of the cotton swab in dawn soap and place it in the water in the middle of the food coloring. Do not stir. Observe the effect and let it amaze you. Repeat steps 2 through 4 with water and heavy cream. Observe which plate of liquid has the most color explosion. This experiment demonstrates surface tension property, and how soap (which has bipolar molecules) when added to the milk and food coloring has the ability to reduce the surface tension of the milk.The Soap mixes with the fat and protein in the milk, causing the fat molecules to move around and making the food coloring to swirl and have a color explosion effect on the milks surface. In conclusion, our hypothesis was proven two thirds correct. We thought that both the 2% and heavy cream would have created a big color explosion when the Dawn soap was touched to the food coloring. However, only the 2% actually caused a dramatic color explosion, as the heavy cream was too thick, and only created a minor explosion. The water, as we expected, created no color explosion at all. My name is Jack. I am 10 years old and in Mrs.Camarra's 5th grade class.I play soccer and lacrosse. I enjoy skiing, hiking, and hanging with my friends. My favorite subject is science. I live with my Mom, Dad, older sister and my english springer spaniel dog, Moxie. My name is Jaden Rothschild. I am 10 years old and a student in Mrs.Vita's 5th grade class. I play hockey and soccer. My favorite subject is math. We have known each other since we were two years old in pre-school. We are very good friends, and have been playing soccer together since Pre-school. We have been on the FC Fire soccer team since second grade and RPL soccer for three years.